Turtle Moon Studios. Susan Shie. Turtle Trax Diary 10-1-97. I can't believe I'm writing again so soon, but I have to, in order to show you what happened last evening. Well, it started when I began four little paintings to try to sell on the web, in the "Diary Spinoffs" Stuff to Buy section, which I hadn't done yet. I began with a face on each, and a hand raised, like to wave. Then I added a crescent moon and stars. Hmmm.....how was this going to fit in with the diary? So I'd keep coming back to these paintings of Anonymous, working on the mystery woman. I decided finally she could be some kind of saint. Saint Helga? I donno, I don't know any Helgas. But then it was time to walk Hattie. So we went off, carrying a green umbrella, in case we got rained on. After a while, this issue of naming the saint popped into my head again. OK, really now! Saint Who?? "Quilta" popped in next. What?? OK, but what after that? I hadn't gotten anywhere with Saint Helga of...Joy?, of...Persistence?. Nah! So Quilta of...? Saint Quilta the...the...The Comforter. The Comforter??? Hey, I liked that! The more I thought about her name, walking along, the more I liked Saint Quilta the Comforter!! Hattie liked her, too. LATER NOTE: This is the very first image I ever made of St Quilta the Comforter, in a set of four paintings on fabric. 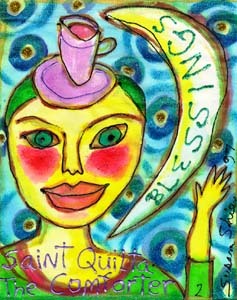 This Saint Quilta, the very first spontaneous manifestation, was a painting series of four. On cotton duck, about 11" x 8.5" each. They are all sold to good homes now, but you can look at more St. Q goodies which need places to manifest! My dear friend Jane Burch Cochran owns the #1 painting in this first series of St Quilta works, and that makes me very happy! This page updated by Susan Shie, February 6, 2005.